Click on an image to see the full-size version! AB shipping box – more fun than one from Amazon! 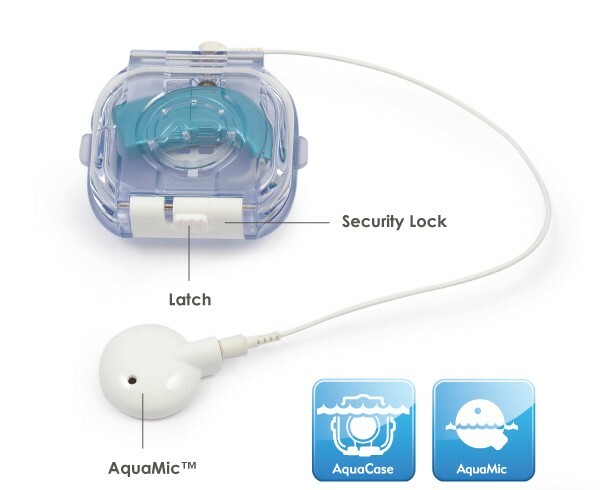 AquaCase Kit contents – Optional rotating clip shown, lanyard and armband not shown. 5 extra O-rings – the only replaceable part. Naída plugs into AquaCase. You can leave the T-mic or ear hook attached. The only battery that works with the AquaCase is the small 110 rechargeable. AquaCase with Naída – Mic is on headpiece. not inside a bag or cover! Slide spring-loaded button to the left, then swing up the latch. It’s a challenge for curious kiddo fingers, but older kids and adults can do it with one hand. MED-EL has received FDA approval for the WaterWear waterproof cover for the RONDO processor. Grab your swim trunks and dive in! WaterWear should be available in early 2015. Advanced Bionics announces the US availability of the AquaCase for the Naída processor. 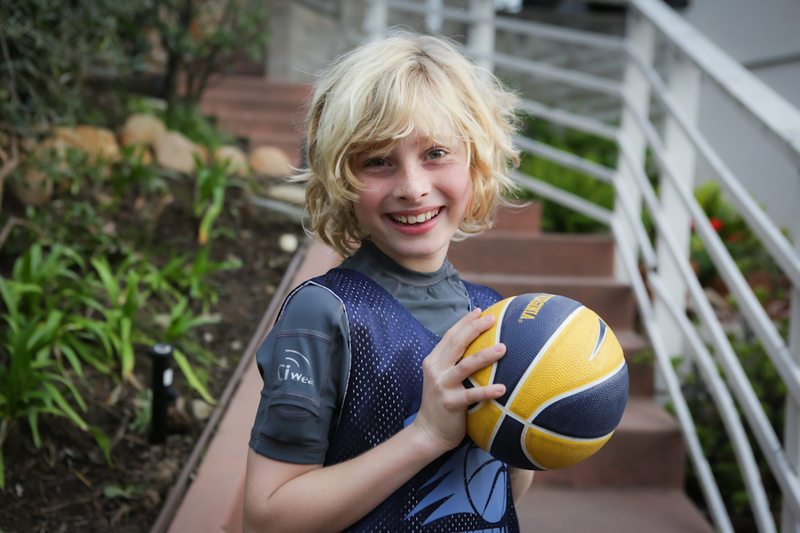 From bath time, swimming and snorkeling, to skiing, trail hiking, mountain biking, mud running and rock climbing, the durable AquaCase offers Advanced Bionics recipients uncompromised hearing performance and peace of mind during even the most rugged adventures. To ensure it safeguards the Naída CI sound processor in any environment, the AquaCase features a security lock and special corrosion-resistant materials that stand up to water, dirt, mud, sand and other grime. Recipients can wear it just how they like it, with a compatible clothing clip, on an armband* or securely attached to a lanyard. The Naída CI Q70 processor is inserted into the AquaCase, with a waterproof connector plugged into the headpiece cable socket. 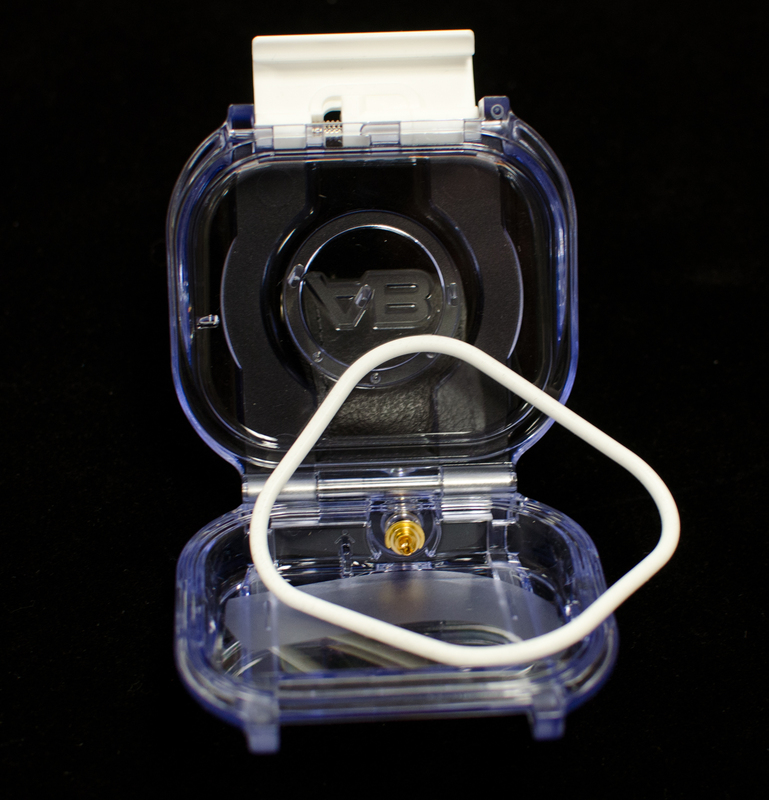 And a T-mic or ear hook fits into the AquaCase so there is no need to remove them. The AquaMic waterproof headpiece microphone is connected to the external portion of the waterproof connector. In order to minimize the size of the AquaCase, only the smallest rechargeable batteries, the PowerCel 110, will fit inside. Over time the only part of the system that may occasionally need to be replaced is the O-ring seal, which is easily accomplished without any tools. Pricing for the AquaCase and accessories is $475, and if you don’t already have an AquaMic and AquaMic cable, the complete system is $950. Until December 31st, 2014, Advanced Bionics is offering a $100 discount on either the AquaCase or the AquaCase & AquaMic in the United States. Contact customer service to order yours today! By Katie-Louise Bailey I had the opportunity to try it out the new AquaCase at the Advanced Bionics Family Fun day at Centre Parcs, Nottingham, UK. Before trying the AquaCase, I had already experienced hearing in water using my very own lime green Neptune. Hearing in water makes swimming so much more fun. You’d be surprised at all the sounds you’ve been missing if you have not heard while swimming before. You won’t want to go swimming without it! Holding the AquaCase in my hand, I can see the best things about it. The AquaCase is clear, slim and small. It’s not too bulky. And it looks very secure. Parents won’t have to worry about their child’s Naída CI Q70 breaking or getting wet. They’ll have peace of mind since it is especially made to protect children from opening it. Even me… It took me a while to open it. It’s a bit like a child lock in the car. With a little practice it becomes much easier to open. I wear a Naída CI Q70 every day. And only tend to wear my Neptune for swimming and for backup if my current processor breaks. Do you ever worry about breaking your processor? I do all the time. It’s like your lifeline. As soon as it hits the floor – the first thing comes to mind is does it still work? The AquaCase is shockproof, so it protects the processor if you drop it. It still works. So if you fancy going down the waterslide or do any rough activity you’ll have a worry-free experience. The AquaCase may even be stronger than the Neptune! The AquaCase goes with anything. There are multiple wearing options, from clip, to lanyard and armband. I prefer to wear it on my armband just like my Neptune. I wear it with a 15 inch cable. You can easily clip it to your bathing suit. Men may prefer to clip it onto the armband. Wherever you go you don’t have to change processors from Naída CI Q70 to a Neptune to go swimming. You can just wear your Naída CI Q70 anywhere. Just make sure you have the case with you. You don’t need to put it in a plastic bag, which could affect the sound quality. The AquaMic and the AquaCase are both 100% waterproof. Placing your Naída CI Q70 In the AquaCase is pretty simple too. You don’t need to change the ear hook or anything. Just make sure you have the 110 battery and of course the right microphone. You can easily tell the difference between the AquaMic and the normal UHP headpiece. The AquaCase and the Neptune have similar wearing options, and the same sound quality. As for the AquaMic – to have the best experience in any activity I would suggest that you make sure to have the right magnet strength so you don’t have to worry about it falling off. It took me about 2 swimming session before I determined the right strength. Now I dive into the water and it doesn’t come off at all! I use two magnets inside the AquaMic, which is enough for my long, thick hair. I’ve used both the AquaCase and Neptune in lots of watersports and other sporting activities. If I had to choose between a Naída CI Q70 with an AquaCase or a Neptune, I would choose the Aquacase. You don’t have to keep changing devices. And the AquaCase turns the Naída CI Q70 into a Neptune, so you can feel secure in wet or dirty environments, or even just for rough sports or amusement parks. I’ve broken the Neptune cover one or two times – I’m very active! The AquaCase seems even stronger, and I don’t think it will break. I’ve worn it playing football, and on waterslides, and it held the processor very securely, even though it was bumped many times. My advice is that you hand dry the AquaCase before opening it, so that all the water is off before the processor comes out. When you use the Naída CI Q70 in the AquaCase, you should also put the processor and the AquaMic in the dry box over night. 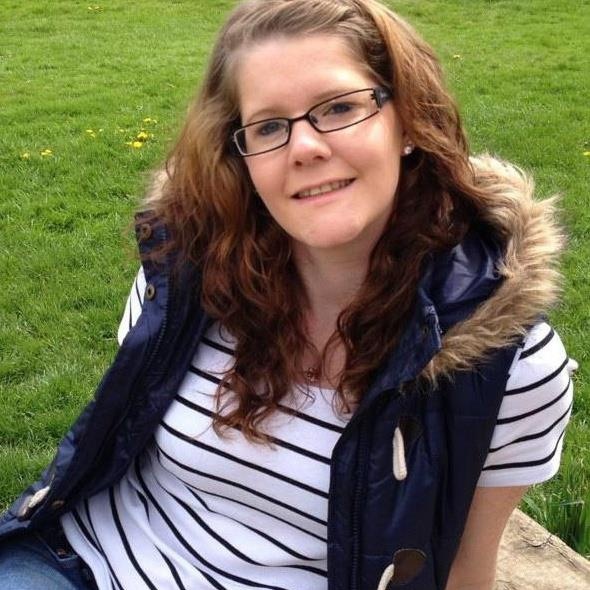 I’m 26 years old, profoundly deaf since birth due to genetic causes. I was meant to get a cochlear implant when I was 7 but my parents decided against it because cochlear implants were still quite new then. 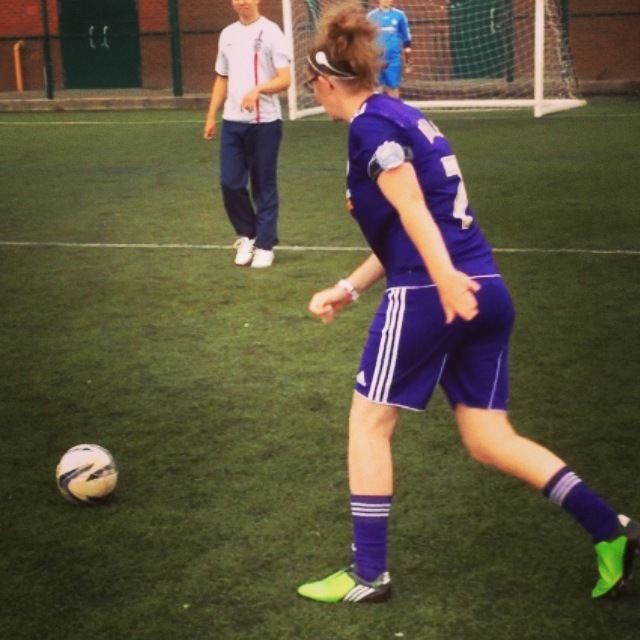 I had a life-changing operation when I received my cochlear implant at age 19. After being implanted It took a lot of practice to be able to understand all the new sounds. I now use my voice practically all the time. People call me a chatter box! I love music, which never even interested me before. I really would love to go bilateral. Here in the UK, the National Health Service only allows children under the age of 19 to go bilateral. MED-EL joins the pool party with a waterproof cover for the RONDO processor! It looks like a two-piece conforming bag with a sticky seal. Thanks to Bob MacPherson for pointing out that the IP68 rating implies a truly waterproof seal, which means the zinc-air batteries would likely need to be replaced by 675 LR44 button cells. A small hole is provided for a tether. We will have to wait and see if MED-EL will provide the tether, or if is up to the user. 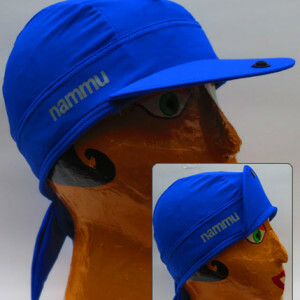 The Nammu Swim Hat looks like a great option for keeping the RONDO in place while using the WaterWear accessory! Advanced Bionics introduces the AquaCase for the Naida CI Q70 processor, just in time for summer! 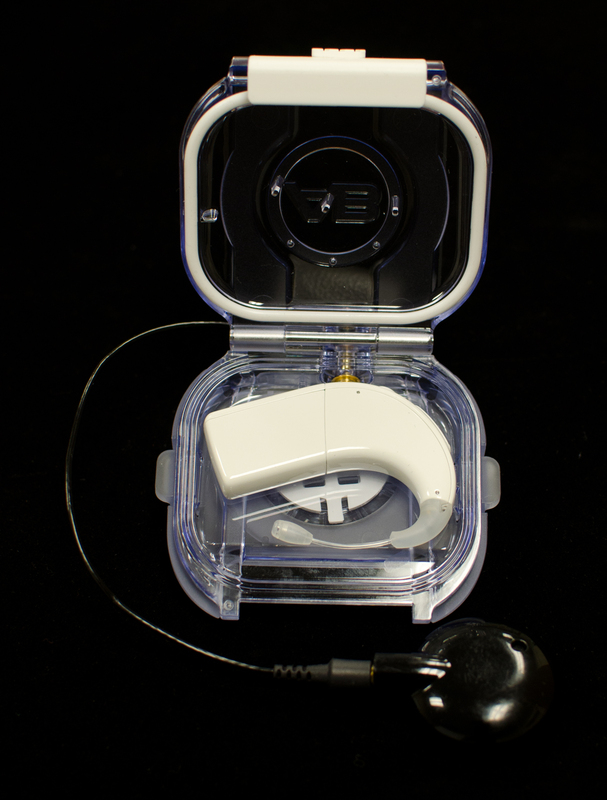 The recently released Ci Wear shirt is a welcome addition to our cochlear implant repertoire. We are a family of five, and two of our three children wear Advanced Bionics cochlear implants. Our nine year old son wears the Naída CI Q70 processors and our three year old daughter wears the Neptune processors as their go-to processors. 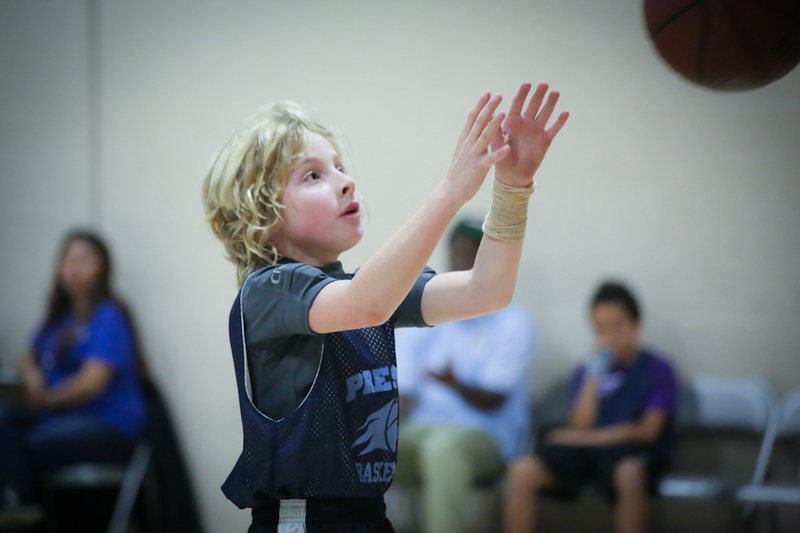 However, whenever my son participates in sports, he always wears his Neptune processors. Our family is very active and involved in many sports and outdoor activities. We live near the ocean, so beach time and swimming are a big part of our daily lives. 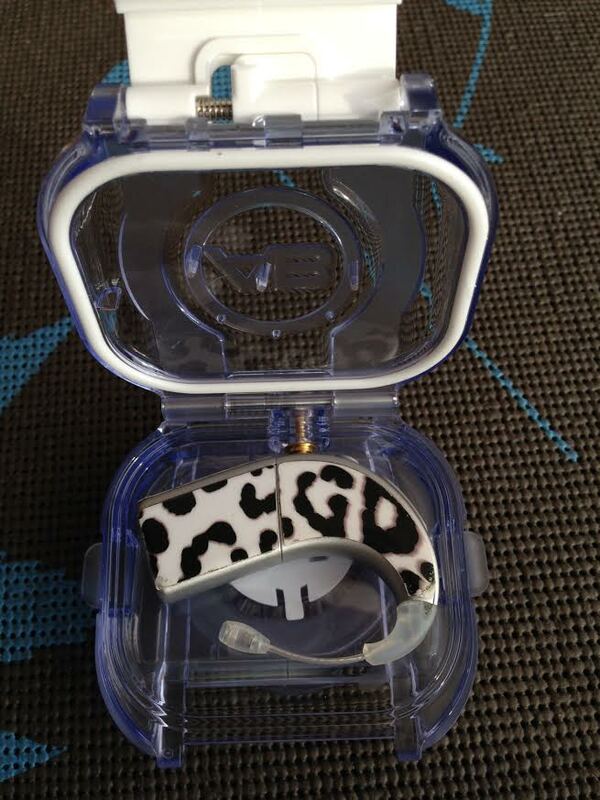 We’ve struggled for many years to come up with a good way to wear the cochlear implant processors at the beach. Prior to the release of the waterproof Neptune processors, we tried Ziploc bags and fanny packs, modified Otter box containers, and many different homemade pocket shirts to hold the CI processors. 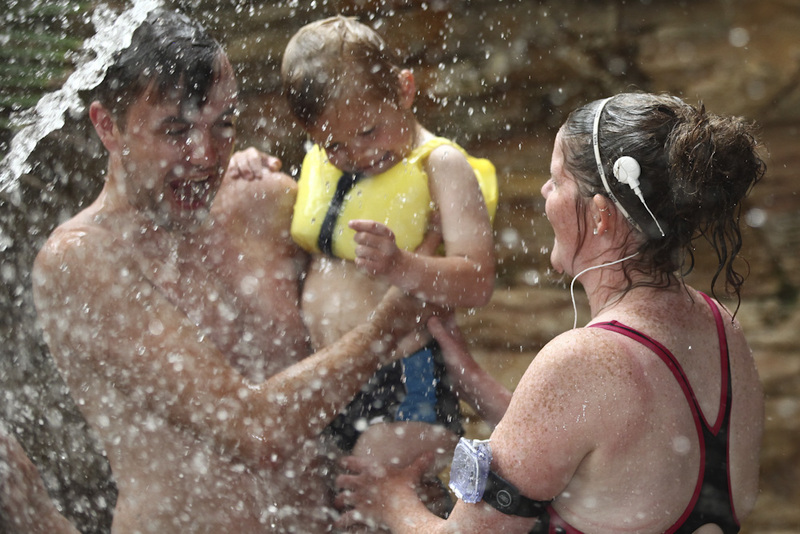 We were ecstatic when the waterproof Neptune processor was released, but still struggled to find the right wearing option that worked for our family during water activities. I again tried sewing my own pocket shirts for the beach to hold the Neptune processors, but wasn’t able to make a shirt where it wasn’t obvious there was a CI processor attached, and couldn’t find a way to keep the cords from becoming tangled. At a routine visit to our audiologist I was shown a prototype of the new Ci Wear shirt. At first glance it seemed like the perfect solution for wearing the CI processors at the beach. I was excited to try it out and see if it really worked as well as I thought it would. We were sent home with a prototype shirt to try out. The shirt looks and feels like a high-quality rash guard shirt and is well-made. The shirt is very well designed with pockets on each sleeve where the processor can be inserted. There is an elastic band in the pocket where the processor can be clipped for added security. Inside the back of the pocket there is a small hole to thread the cord through, and another loop inside the neckline to thread the cord through which helps keep the cords nicely in place and prevents tangling. The loop in the neckline also helps keep the cord and headpiece in place when the headpiece falls off, making it much easier to find the dislodged headpiece and put it back on. Another nice feature of the shirt is that it isn’t obvious that my kids are even wearing CI processors at all. The CI processors are barely visible when inside the pocket (it just looks like a bump in the shirt), and the cords are nicely concealed inside the shirt and only appear where they come out of the collar. Our first sporting activity after receiving our prototype shirt was a soccer match. Although the shirt was designed for the water, I decided to give it a try for my son’s soccer game to see if it helped hold his processors in place. His normal way to wear his Neptune processors was to clip them to the collar of his shirt, but they would bounce around when he ran, and the cords were always an issue. I inserted both processors in his shirt before he put it on, then he put the shirt on with the processors already in place and off he went. I was concerned he might get too hot in the rash guard because it is a thicker material than a regular Under Armour shirt, but it was not a particularly hot day and he didn’t complain. The shirt worked amazingly well and kept both his processors and cords tucked away while he ran up and down the field. It also hid his processors nicely. The shirt was an improvement over the way he used to wear his processors. We didn’t get a chance to go to the beach before I had to send the shirt back so I didn’t try the prototype shirt at the beach. I received an email a few weeks ago that the shirts were available for sale and immediately purchased two: a gray one for my nine-year old boy, and a blue one for my 3-year old girl. I couldn’t be happier! We’ve now worn our shirts at the beach in the water and they work extremely well. The processors are very secure in the pockets and I don’t have any worries about the kids losing their processors in the waves while boogie boarding or surfing. The cords do not tangle nearly as much as they used to due to the loop in the collar that keeps each cord on the correct side. It’s also nice that the shirts have built-in UV protection – an added bonus. My son also routinely wears his Ci Wear shirt under his basketball jersey and it works equally well for basketball. I’m sure that his CI Wear shirt will become a standard part of his uniform he wears for any sport. The shirt should also work well for other CI processors (not just the Advanced Bionics Neptune processor) – particularly any processor with an off-the-ear wearing option. In fact, I put my iPhone in the pocket and it fits nicely due to the stretch in the material. I’m thinking of ordering one for myself to hold my iPod or iPhone while running. My son that does not wear CI’s also wore a CI Wear shirt at the beach and filled the pockets in the arm with his beach “treasures”. I plan to buy one for him as well! My wish-list for the CI shirt would be to have the shirt also available in a thinner material for everyday use as a pocket shirt under regular clothes for my daughter that wears her Neptune processors on a daily basis, and for sporting events other than the beach. Of course pink would be a nice color for all the girly girls out there. Overall this is an excellent product and I am happy to have a well-designed, good-looking shirt that not only conceals my kids CI processors, but keeps them safely tucked away for sporting and outdoor activities. Thank you Ci Wear! Terrie Kellmeyer is a mother of three active children, two of which wear cochlear implants. Although she has never let her kids cochlear implants limit their sporting and beach activities, she is appreciative of having a new wearing option to hold their cochlear implants which allows her kids to focus on the important things- getting the basket or catching the wave, not worrying about losing a processor! For additional information she may be contacted at terrie.kellmeyer@cox.net.